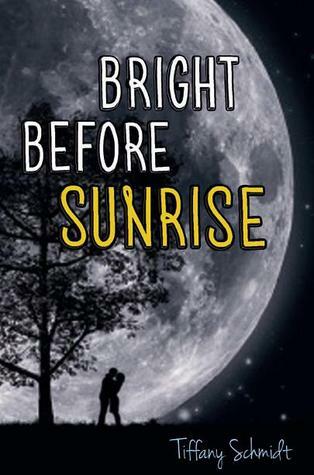 Author Tiffany Schmidt, of the recently published young adult novel BRIGHT BEFORE SUNRISE, has asked various authors and bloggers to share their "One Night" stories in response to the book's tagline: One night can change how you see the world. One night can change how you see yourself. I decided to share my own One Night Story, digging a bit deeper into a very emotional time in my life. Most of you know that I lost my mom to cancer awhile ago. I've shared bits and pieces of that time in my life and how it's affected me now. But for this particular assignment, I am going beyond the surface and sharing a very personal moment, one that I immediately thought of when I read this book's tag line. It was the fall of 2003 and I was 22 years old. Most of my friends had just finished college and were on the cusp of starting their career. I, on the other hand, was still slowly making my way through school, not having a clue what I wanted to do with the rest of my life. But then, life threw me a curve ball, one of the biggest plays in my lifetime that I will ever see. My mother was diagnosed with stage 4 vaginal cancer that had metastasized to her lungs. There wasn’t a cure, we were told. All that was left to do was to make sure she was comfortable. One day I was beginning classes at the community college, and then the next I was listening to doctors tell me that my mother only had months to live. There are moments in your life when time feels as though it stops, yet speeds up all at the same time. I found myself in a whirlwind tunnel of hospitals, doctors, IVs, vitals, and tears. Oh so many tears. We had been in the hospital for about ten days. I say we because between my sisters, my dad, and myself, someone was always there with my mother. Most of the time she was pumped with so much morphine through her IV that she probably didn’t even know someone was there. Looking back though, I know that was more for our benefit than hers. At this point we understood it was more about comfort, and each day there was a new task to battle, an oxygen level to maintain, or a protein count to make. I forgot about the outside world, sometimes sleeping in the same clothes I had worn the day before. One night, it must have been very late, or very early in the morning hours, I remember my mother waking up. She hadn’t spoken a lot in the past few days, so at this moment I was just happy to see a reaction from her. I don’t remember what exactly was said, but I do remember her asking me what was on the TV. I picked up the remote, only finding an early morning news broadcast on and leaving it there. She then asked me to come lie with her in bed. So I slipped out of my flip flops and snuggled up next to her. There we were, just mother and daughter, lying in bed that early morning. She was stroking her pale, fragile fingers through my hair. If words were shared, I can’t remember what they were. All I remember is that feeling of having my mother’s comfort next to me. I told myself to hold on to this memory, that it would later be very important to me. And I was right. This is my last memory of my mother being my mother. Of her taking care of me, nurturing me, loving me. In the next few days that would follow, she slipped further into a comatose state, and then on September 20, 2003 she took her final breath. I have many memories, some nightmares, from the twenty days she was diagnosed in the hospital, to her final day here on Earth. But it is this memory I hold so close to my heart. It’s the way I want to remember her, even through all the bad days we saw there. This one night gave me strength that I could hold on to for the next few days, and eventually for the rest of my life. It’s impossible for it not to change my world, and it most certainly did. But I am ever so grateful for having this one moment to look back on and remember my last memory with my mother, as the woman who always protected me, the woman who unconditionally loved her baby until there was no strength left to fight. My world changed that night, it shifted from fear of losing my mother, to a sense of peace, knowing that whatever happens next, as horrible as it may be, I’ll be able to handle it. And ten years later, I’m continuously learning how to handle it, constantly reminding myself that this has changed me, and will continue to change me. Please visit Bright Before Sunrise's tumblr page to read other One Night Stories: http://brightbeforesunrise.tumblr.com/ Their stories have been heartfelt, as well as humbling. It's amazing how one night can change so much in a person's life. About the book: When Jonah is forced to move from Hamilton to Cross Pointe for the second half of his senior year, "miserable" doesn't even begin to cover it. He feels like the doggy-bag from his mother's first marriage and everything else about her new life—with a new husband, new home and a new baby—is an upgrade. The people at Cross Pointe High School are pretentious and privileged—and worst of all is Brighton Waterford, the embodiment of all things superficial and popular. Jonah’s girlfriend, Carly, is his last tie to what feels real... until she breaks up with him. Thank you for sharing your most personal memory of your mom, Ginger. I know that must've taken a lot out of you and I wish I could hug you right now. But just the fact that you are able to write about it and share it shows how strong you were then and are today. I think that when the day comes that I have to suffer such a loss, I'm going to think back on this and on you and know that I too will make it. :) Thank you. I agree with meg. No words, just tears and hugs. Thank you for sharing such a memory. Oh G. Thank you so much for sharing this. What an absolutely beautiful memory to have of your mother.